Savers love cash-back cards. Unlike rewards cards that grant points, cash-back cards return a fraction of what you spend in good old U.S. currency. Used responsibly, cash-back cards effectively give cardholders a discount everything they buy. But for the less disciplined -- those who carry a balance, for example -- be warned: You'll probably pay more than you earn in cash-back bonuses. Many cash-back cards offer 0% introductory rates that last for six to 12 months while charging a percentage of the balance as an upfront fee. Capital One's (COF) Cash credit card, for example, exempts interest for a year while charging 3% of transferred balances. The hope? You'll fail to pay the balance in time, kick-starting interest payments at 12.9% (or worse) while earning no more than 1.5% on your spending. Fortunately, that's the worst-case scenario. Disciplined savers can bank hundreds of dollars yearly when paying off balances regularly. The trick is knowing how to maximize your payback, and doing that requires some effort. The best cash-back cards offer quick redemptions and unlimited earning. Does JPMorgan Chase's (JPM) Freedom card measure up? That's the question before us today in this ongoing series examining the best (and worst) credit card offers out there. 1. You don't get 5% cash back everywhere you shop. Unlike the Capital One Cash card, Chase's Freedom card offers 5% cash back on certain categories throughout the year. For 2012, money spent at Amazon.com (AMZN) from now through March earns 5%. Best Buy (BBY) shoppers won't earn that much till the holiday shopping season kicks off in the fourth quarter. 2. $100 sign-up bonus. New customers get extra cash back after using the card to spend $500 in their first three months. Capital One offers a similar bonus, which isn't surprising. Banks tend to match frills in order to win customers, knowing that switching into and out of card accounts can take a toll on credit scores. 3. Two introductory expiration dates apply. Here, too, it's standard practice to trade short-term 0% interest for the prospect of huge long-term profits when (ahem) "normal" double-digit rates kick in. Chase Freedom sets the zero-interest clock at six months for purchases and 12 months for balance transfers. The downside? While there's no annual fee and no earnings limit at 1%, Chase caps higher-rate accumulations at $1,500 in spending per quarter. So forget about dreams of receiving tax refund-sized rebate checks. Balance transfers also include a fee equal to 3% of the balance or $5, whichever is greater. Apply for this card if you're a disciplined saver who avoids debt but craves additional benefits for using credit cards for everyday spending. You'll earn higher average cash awards and enjoy the flexibility to earn even more if you're aggressive. 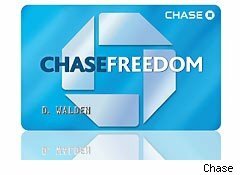 Let's run the numbers to see how rewarding it can be to carry the Chase Freedom card: Say you follow Chase's calendar and spend the maximum $1,500 per quarter with qualified merchants. Let's say you also spend $18,000 more -- or $1,500 monthly -- on other purchases. Your $2,000 in monthly charges will net you $480 in cash in an average year and $580 in your first year. Again, refer to the checklist above. Quick redemptions and unlimited earning potential is what you want if you're in the market for a cash-back card. On these two attributes, the Freedom card appears to deliver. Just go in knowing that Chase is hoping you'll one day carry a balance and use (ahem) "cash back" to pay down balances. Don't fall for it. No matter what the marketing material says, it's always better to collect interest than it is to pay it. What credit cards do you use? What is the best credit deal you've found? Please let us know using the comments box below. Motley Fool contributor Tim Beyers didn't own shares in any of the companies mentioned in this article at the time of publication. Check out Tim's portfolio holdings and past columns. The Motley Fool owns shares of Amazon.com, Best Buy, and JPMorgan Chase. Motley Fool newsletter services have recommended buying shares of Amazon.com and writing covered calls in Best Buy.